Republicans seem to think Democrat Conor Lamb is going to win the highly anticipated special election in Pennsylvania’s 18th Congressional District on Tuesday. They are already pointing the finger at Republican Rick Saccone, who many feel has been an inferior candidate. “I think it’s been a race, since day one, about candidate disparity,” one Republican close to the race said. With just hours to go before polls close in Pennsylvania’s closely watched special congressional election, Republicans are already pointing fingers at their nominee, whose inferior candidacy they are blaming for what they increasingly believe will be a defeat. In the race’s final days, polling has shown Lamb leading Republican Rick Saccone in a district President Donald Trump won by 20 points in 2016 – and that a Republican has held for the better part of two decades. But the same polling showed that Trump is still relatively popular in the district, leading Republicans to bring out the knives for Saccone. Lamb has dominated the fundraising battle against Saccone in the special election for Pennsylvania’s 18th Congressional District, which Republicans highlighted as a significant problem for their candidate. Meanwhile, several Republicans involved in the race said their recent polling showed Lamb with a slight lead. Outside groups have sought to make up the fundraising difference by injecting money and support into the race. The Congressional Leadership Fund, for example, provided 50 door knockers and spent more than $US3.5 million on the election effort. This strategist said that, based on the polling available, it’s clear Trump was not the reason for why the race in a traditionally Republican district has been so tight. 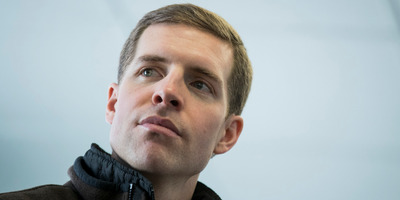 “And I think there is one saving grace for Republicans coming out of this election – Conor Lamb is a unicorn candidate, and there aren’t many Democrats running across the country who will mirror him,” they said. Lamb is a young former Marine and federal prosecutor. Saccone serves as a state legislator who is an Air Force veteran. “Despite the expected protestations that Saccone was a terrible candidate, the GOP will have to account for the fact that the president’s endorsement – even in a district that he won by twenty points, and even though the President has said he wants to do more candidate endorsement rallies – will not help Republican candidates,” he said.